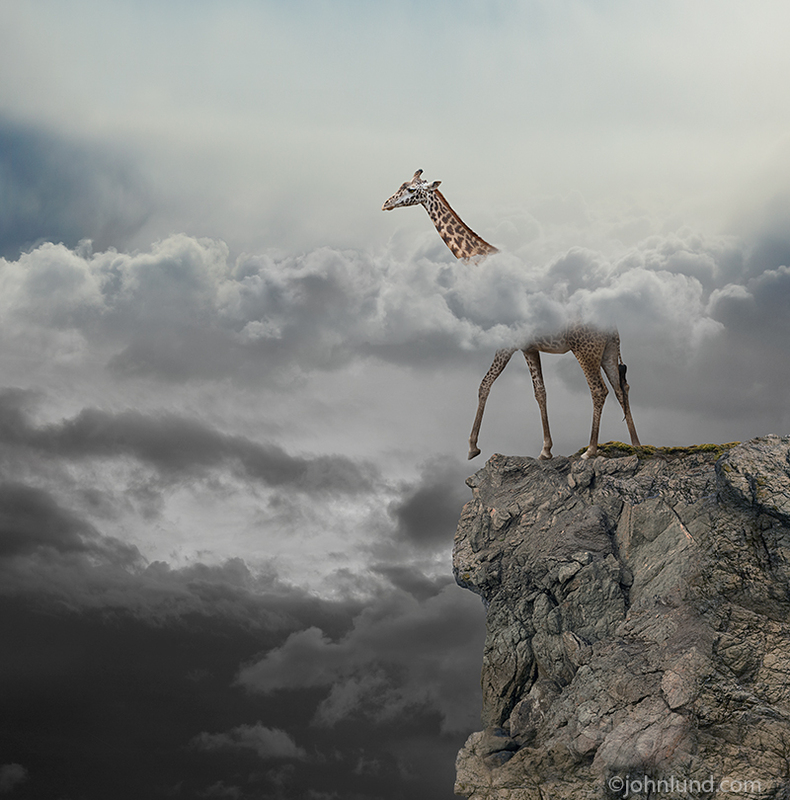 A giraffe stands on the edge of a cliff, his head above low lying clouds in an image illustrating concepts such as vision, risk and danger. I feel like this giraffe, embarking on a journey the outcome of which I cannot see clearly. A few days ago I decided to check out 500 pix. Unfortunately, within the first five minutes of looking at 500 pix I came across an image that was doing rather well (a ranking of 97.5) that was, in effect, my image. That is, someone had stripped out an elephant sitting on a bench from one of my images and stripped it in to a room. There were quite a few comments congratulating the photographer on his creativity and so forth. I added a comment…that the image was my copyrighted photo and that he should take the image down immediately. A few minutes later he replied that the image was not mine and that he had downloaded the image for free off of the Internet. I have seen the image floating around the net with a clumsy job of cloning out my watermark, but by stripping the elephant out of its original background the watermark, or area where it once was, was not included. BTW, the image was clearly mine with every wrinkle in the elephant’s skin matching my elephant. I clicked on the “Report This Image” button and fairly quickly 500 pix removed the offending page. 500 Pix is now selling stock photos. It strikes me that they may have their hands full policing the site…and dealing with model releases. I guess we shall see. In the meantime, aside from being steamed, I am wrestling with this whole Internet theft and watermarking issue. In this new world of social media and sharing photos we can garner much more attention with minimal or no watermarks, but it sure opens up our imagery to theft. So what is better, to go for visibility and recognition, or try to maximize the protection of your imagery with large and intrusive watermarks? Emotionally I want to try and stop the theft, but logically I think it is probably better for one’s career to go for the visibility. If you take it to the extreme, you can totally prevent theft by never showing your work at all. And when your images are stolen, I suspect there really isn’t that much damage done financially to individual photographers (hey…don’t flame me for saying that), though collectively there sure is a lot of money being left on the table! Ultimately, if someone steals the image I get nothing, if they don’t steal I get nothing, but it they share it there may be profit for me in increased links, web traffic and visibility. Recognition works for us in multiple ways. With sufficient visibility it makes it much more likely your work will find those legitimate users with the money to license imagery, it certainly increases the odds of getting assignments, and it helps insure that you get the proper credit for your style or treatment of photography. When an art director or designer sees your portfolio, if they are already aware of you from other sources (think Internet), then they are much more likely to be appreciative and receptive to your book. If you are trying to earn money it is better to be known than unknown. So for now, I am going to reduce the size of my watermarks (I use ©johnlund.com so that people know where to go to license the image if they are legitimate licensors) and see what happens. John: Wouldnt it be better to make the watermark really big to help deter theft (not smaller)? I am switching from bigger to smaller to watermarks to facilitate sharing. I imagine theft will increase, but hopefully the benefits to me will increase as well. We shall see! Register your images with the US Copyright office.I collect over $22,000 USD a month on a small amount of infringers.Minimum invoice is $1500.00.A slap on the wrist take down notice does nothing to stop someone from stealing. You certainly have my attention with that statement! I'd be interested to know about how you go after the infringers. A lot of my images are registered and I have started registering them regularly. Can you get that kind of money from ordinary bloggers and such? John: Have u ever collected from infringers on images you have copyrighted? If so, how did you go about it? I personally have never collected on an infringement though Getty and Corbis have collected on my behalf. But the previous poster has certainly gotten me thinking about it! I'd love it if he or she would share their process! John: Are your overall sales with Getty going up or down? or staying level? My Getty sales have been declining, which is not unexpected as I give 90% of my imagery to Blend. It is actually kind of surprising that the decline is relatively slow! John: Maybe its time you submit more to Getty and less to Blend? I know you are part owner in Blend...but most of Blends sales are probably through Getty and Corbis anyway....right? Through Blend the same images are available on Getty, Corbis and something like 162 additional distributors. Some sell everywhere, some sell only on Getty, some only on Corbis...and every combination you can think of. Recently I have some really nice sales through Gallery stock. I believe that my images get more visibility through Blend thereby generating more income, with less risk, than I could get through Getty alone. I also get more support through Blend as well. Think I'll stick with my plan! 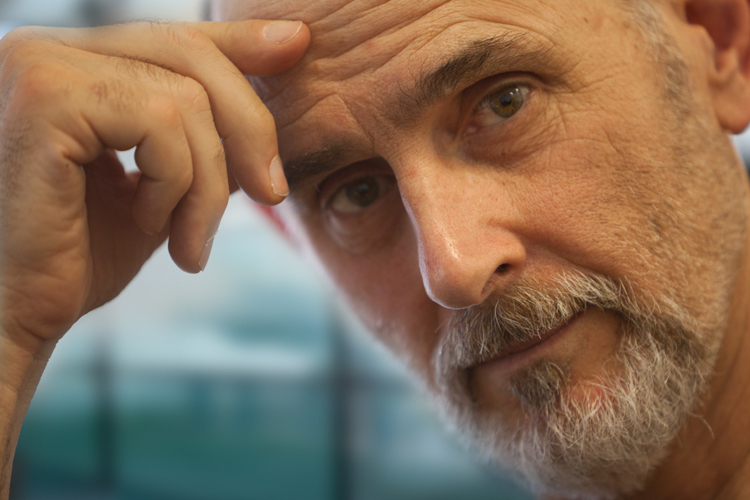 John: How does one become part-owner of Blend? Blend is a partnership founded by twenty-three photographers about a decade ago. At this point the only way to become an owner would be to buy out an existing owner but that would require a pretty unusual set of circumstances. Blend now has over 100 contributing photographers and is continuing to grow and take on additional photographers...just not as owners. Once everyone believes that all photography is free, the ability to justify payment for your efforts is gone. This is not a good trend and allows those that produce nothing to monetize our work without sharing any of the revenue. If they share the revenue from their traffic with me that's good if I agree to their split. To rip me off on their terms is not. Working for exposure (picture credit) will get you broke in a hurry and devalues your work with anyone that might have considered you at the price point you attempt to justify and need to sustain your business. Give it away and watch the paying jobs pour in eh? I think not. Creative people do not work for free if they are professionals and intend to stay in business. Do the web hosting entities, programmers and web designers do what they do for free or do they act in a way to create revenue from web traffic using our creative material? We know they don't work for free and their model depends on exploiting us. Justifying theft by stealing someone else's works online is NOT OK, and should NOT be promoted as being "OK" because one thinks they cannot control it. You can and should control it. Do you steal your neighbors car "just because" it is parked in his driveway? Theft is theft. Only a non professional photographer would be this passive about protecting their own works. Please consider this entire industry before making the bad choice of giving up on your own works. Twitter, etc do the same. Don't complain you have no control, you do, but you need to take a stand and do your job. Photography is a business based on intellectual property. Forgetting that is like a dentist forgetting to close a root canal. Do you job, and protect your works. If you don't do it, no one else will do it for you. ^This. Maybe I've just been terribly unlucky, but I've had my images stolen from both my website, Flickr and the agency I work with. In all the cases I could find — some to illustrate some very well paid blogs, etc — my name or the name of my brand were nowhere to be seen. Some of them went to the point of having 10k notes on Tumblr (!!!) without so much as a reference to my authorship. How does that give me recognition? How would that ever link back to my portfolio or my business page? It just doesn't. Your argument is completely invalid on this term. Seeing your work posted and used without your consent works only to make you lose track of your work. Nothing else. And I'm sorry to be so blunt, but articles such as this one — in which you half-validate the thief's perspective — are extremely dangerous. You're basically opening up a precedent for people to say 'oh, but he allows it!'. And sadly, you're not the only one. I am not advocating eliminating watermarks and copyright notices from one's images. I have had more than a few people contact me seeking to license images, and thanking me for making it clear where to find me by including that information on the image. I always watermark my images with ©johnlund.com. What I am proposing doing differently is to have my watermark be less obtrusive, but still very visible. What I want is to have people link to my work to help build traffic and rankings so that I can get the work in front of those who do wish to license it. I have also begun registering all of my work with the copyright office. The conundrum is that most of the thefts I find in regards to my own work, and there is a whole lot of it, is more time and trouble to pursue than it is worth. Ok, here are my thoughts. There is what's right for you business-wise in the short run and there is what's right for artists, photographers, writers as a whole in the long run. You should feel free to do what is best for you in the short run. But we all need to be aware of the dynamic. Facebook, Google, (probably 500 pix, I haven't check them out), etc., are in the business of selling information on their users. They get this information by providing content that generates interest, thereby drawing users to their service. The cheaper this content is the more money they make. Like any business that sells a product (in their case user information), they want to buy low and sell high. Therefore it is in their business interest to devalue creative content. Finally, it should be noted that copyright is a segment of intellectual property, along with patents for example. So, I want to point out the hypocrisy of these companies trying to devalue copyright while at the same time fiercely guarding their patents. John: We need a new post from you! Okay, okay! I get working on something!